Berthe Morisot (b. Bourges, 1841. d. Paris, 1895) was a major figure in the development of the Impressionist movement or Impressionism. Figure l. Portrait of Berthe Morisot by Edouard Manet, oil/canvas, 1872, Musée d'Orsay, Paris. Click on each image for enlargement. Berthe Morisot & her sisters, Edma & Yves, were brought up in a wealthy & respectable 19th century Parisian household. Their upbringing included various cultural accomplishments--the art of conversation, music, art appreciation, drawing. Early on, Berthe & Edma were tutored in painting by Corot, who had become a family friend. Berthe's painting flourished & she was directly influenced by a fellow Impressionist, Edouard Manet, who had become her brother-in-law when Berthe married Eugène Manet. 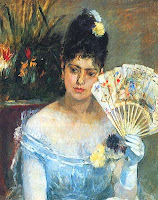 Towards 1885, Berthe followed the example of Pierre-Auguste Renoir. Figure 2. 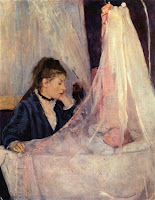 Berthe Morisot, The Cradle, oil/canvas, 1872, Musée d'Orsay, Paris. Figure 3. 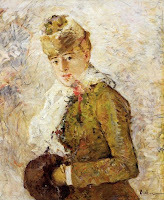 Berthe Morisot, Winter, aka Woman with a Muff, oil/canvas, 1880, Dallas Museum of Art, Dallas. Women artists like Morisot & Mary Cassatt, another Impressionist, were severely limited in the places they could go to in 19th century Paris. The majority of their subjects centred around women & children, the home with motherhood, child-rearing, the gatherings with women friends & a few urban sites at the theatre & opera. In contrast, their male colleagues were free to go wherever & whenever they pleased to paint without breaking any taboos. Likewise, the paintings of the male Impressionists showed a wide variety of subjects & locations--city cafes, bars, brothels, the theatre back stage & other public urban spaces during the night or day. Figure 4. Berthe Morisot, In Dining Room, oil/canvas, 1875, National Gallery of Art, Washington, D.C. Figure 5. 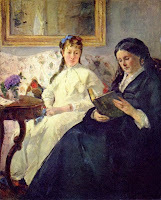 Berthe Morisot, The Mother and Sister of the Artist, oil/canvas, 1869-70, National Gallery of Art, Washington, D.C.
Berthe Morisot was to show at the first Impressionist Exhibition of 1874 & became a regular contributor. Before that, she had been accepted for showings at the official Salon, the major art venue for the Paris art market. "Yet the problem for the critics of her day remained the fact that she was a gifted artist and a woman. The two could not easily be reconciled--there was no tradition (acceptable to men) of women in art, and all the critics and judges were men ..."[l] Morisot's work received faint praise for its charm, delicacy & femininity. Nevertheless, Berthe Morisot was well-liked & respected by Manet, Degas, Renoir, Monet, Pissarro, Whistler & the poet Mallarmé (who became the guardian of Morisot's only child, Julie, after her death). Figure 6. Berthe Morisot, Cornfield, oil/canvas, 1875, Musée d'Orsay, Paris. Figure 7. 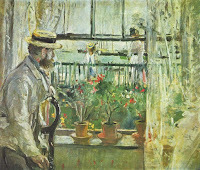 Berthe Morisot, Interior (Eugène Manet) at the Isle of Wight, oil/canvas, 1875. Figure 8. Berthe Morisot, Girl at the Ball, oil/canvas, 1875, Musée Marmottan Monet, Paris. Figure 9. 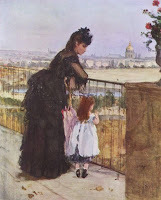 Berthe Morisot, The Balcony, oil/canvas, 1872, Ittleson Collection, New York. Figure 10. Berthe Morisot, The Harbor at Lorient, Brittany, oil/canvas, 1869, National Gallery of Art, Washington, D.C. Figure 11. Berthe Morisot, Reading, oil/canvas, 1873, Cleveland Museum of Art, Cleveland, Ohio. 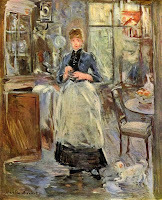 Berthe Morisot was "to become one of the most atmospheric and impressionistic of her contemporaries, having developed a swift, fluid technique using broken patches of bright colour." [l] Robert Katz and Celestine Dars, The Impressionists (London: Anness Publishing Limited, 1994), 274. Smith, Paul. Impressionism: Beneath the Surface. New York: Harry N. Abrams, Inc., 1995. Figures 1 to 11 from Wikimedia Commons. Retrieved October 27, 2007. Live artfully. Sing. Dance. Laugh & love to do many things. Be kind. There's a whole world out there! An Artist to Know: Slideshow of selected impressionist paintings by Pierre-Auguste RENOIR, (1841-1919). Philadelphia Museum of Art, Phil.